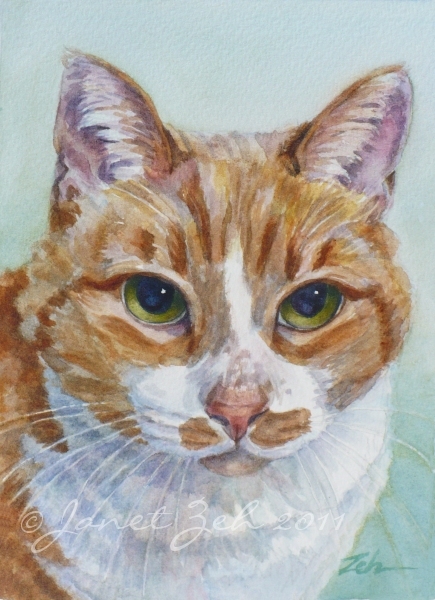 Woody, the model for this portrait, was a beautiful orange tabby cat with amazing green eyes. 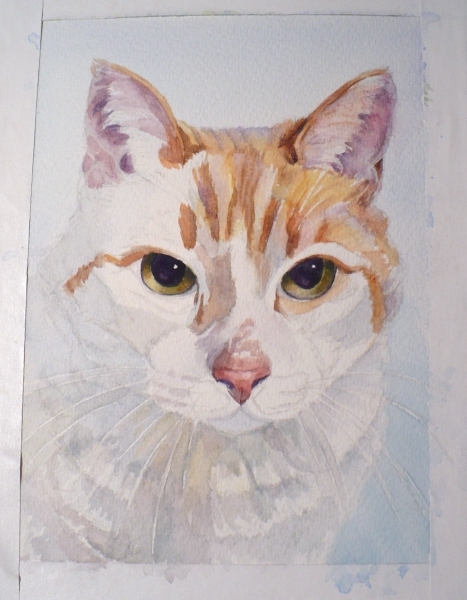 His owners requested the portrait in honor of his memory. I'll show you how I painted his portrait. I begin with selecting a few of the photos that seem to be a good representation of the animal. You can see three of them at the left. I will work from those. I draw the image first on drawing paper until I'm satisfied with it, then transfer to watercolor paper. Once that is done, I wash in a soft background and start adding shadows to the shadow side of the face and body. Here you can see the shadows and some of the gray areas of fur. 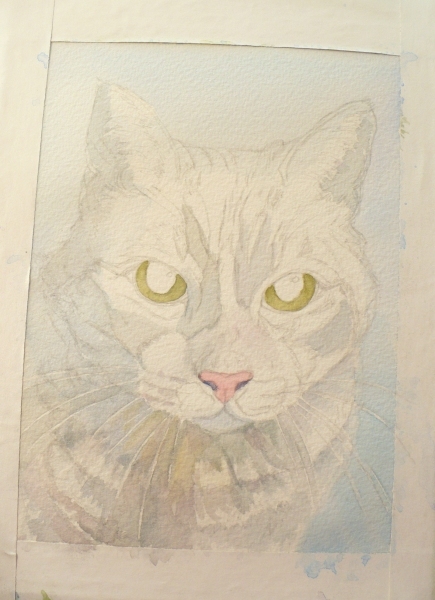 I have not added any details yet, but washed in mixes of blue, red and yellow to make a varying gray color. Because the shadows are already established, it will be easier when painting in the details to keep a rounded look to the form. If there were no shadows, the image would look flat - great for abstract paintings, but that doesn't work for realism! I also painted in a pale green base color for the eyes. Now I begin with some colors. I painted the eyes, the nose and started some of the orange tabby colors for the fur. To make the fur colors, I use mixes of burnt sienna, raw sienna and French Ultramarine blue. Here are more details added including the ears. Notice the top of the head. It appears to be receding back as it should. To accomplish this, I used blue and lightened the top. Not only is blue a cool color, which visually recedes, but it is also the color of the sky. Horizontal surfaces outdoors will reflect the blue of the sky to some extent, so if they are painted a bit bluer than vertical surfaces, they will look like they are laying flat. 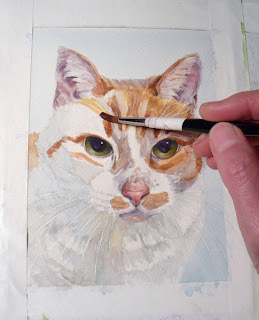 Here I'm painting the details of fur until they are all painted in using the photos as reference for color and specific markings. I take quite a bit of time to do this with a dry brush technique. Since watercolor is transparent, the shadows will peek through. However, I usually need to deepen them as I go along. The under painting is a good guide for this. 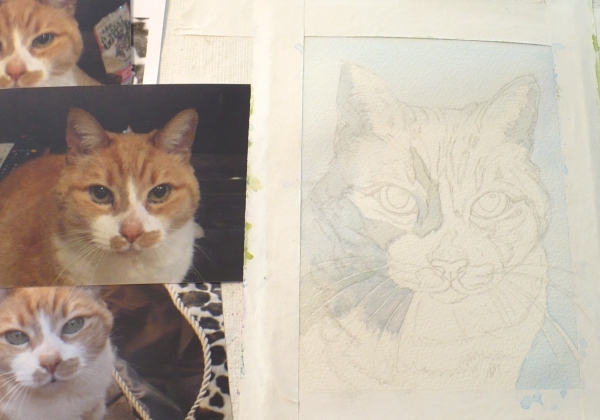 For the whiskers, I make sure they are drawn in the way I want them and simply paint around them. 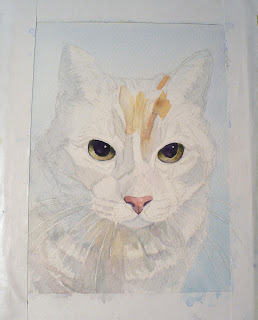 It would also be a good idea to use masking fluid to mask them out if you prefer to do that. Below is the finished painting of Woody. I added a bit of green to the background to deepen the color near the bottom of the painting. Thanks for stopping by for this pet portrait demo. Hope you enjoyed it and learned a thing or two. You can see samples of my portraits at ZehPetPortraits.com. Have a lovely day! Great portrait! Thanks for sharing this!